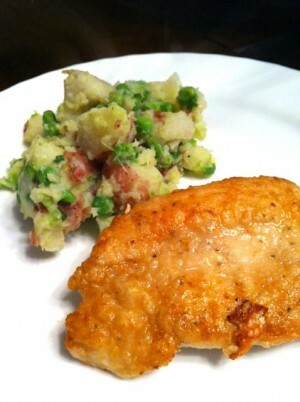 Chicken Cutlets With Potatoes And Peas recipe by maham at DesiRecipes.com. Place the potatoes in a saucepan with enough water to cover. Add 1 teaspoon salt . Simmer until tender, 15 to 18 minutes, adding the peas in the last 2 minutes; drain. Gently mash with scallions, butter, and 1/2 teaspoon each salt and pepper. Meanwhile, season the chicken with 1/2 teaspoon salt and 1/4 teaspoon pepper. Coat with the flour, shaking off the excess. Heat 1 tablespoon of the oil in a large skillet over medium-high heat and cook half the chicken until golden brown and cooked through, 2 to 3 minutes per side; transfer to plates. Repeat with the remaining oil and chicken .